Many managers limit their opportunity by failing to identify their replacement. Not only should you identify valid candidates, you need to take steps to develop their expertise and so that when the opportunity comes, they can step up and do a credible job in filling your position. After all, they may be reporting to you. This last bullet is key, it positions you for promotion! I can’t tell you how many times I’ve had conversations with other senior managers about a young manager’s potential to be promoted but we have to pass because it would cause too much challenge and disruption when they don’t have anyone who can fill their spot. We move on to other candidates that are better prepared to leave their organization. Finding your replacement should start as soon as you take the new job. This doesn’t mean they have to be in place right away. It does mean that you should start determining if anyone can grow to take on the job at some point and how you would begin developing their capabilities. If you have no candidates, you should be finding one when you have a chance to hire additional people into your staff. Senior managers want organizations that run pretty much on their own. Pulling out an excellent manager to give him or her more opportunity gets blocked when your team can’t run well after you leave it. 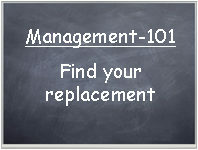 Finding your replacement is a “management-101” type of priority. One reason why many managers fail to position a replacement manager is because they think it will make them vulnerable and possibly position them to lose their job. I can tell you from experience that the opposite is true, , , it positions you to take on more responsibility. Mature managers position their organizations to be able to run without them. Managers who are less mature or insecure build teams that become very dependent upon them, , , not a good thing to do. Senior managers recognize the difference and that’s why some people advance and others don’t. Position yourself for advancement and promotion by getting someone positioned to replace you when the opportunity comes calling. If you aren’t prepared, you will just have to wave “bye” to the opportunity.